1.1 1. Meguiar’s Ultimate Liquid Wax – 16 oz. 1.6 6. Griot’s Garage 11171 Car Wax – 16 oz. 1.7 7. Turtle Wax T-415 Premium Grade Rubbing Compound – 18 oz. 1.8 8. Meguiar’s G17216 Car Wax – 15.2 oz. 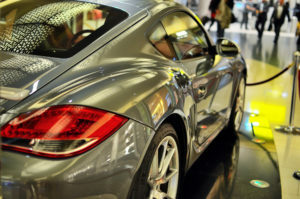 One of the most popular car care products is car wax. Car wax is a chemical compound made from a lot of different ingredients and it is sold in form of hard wax, paste wax (cleaner wax or regular) or wax spray. All of these products have the same purpose and that is to give your car a perfect shine after the treatment, protect your paint and cover small imperfections and scratches. However, there is much more to the subject of car waxing and we are going to show you how to properly wax your car, popular car wax reviews and avoid common mistakes. Follow our simple guidelines, learn about the waxing and find the best car wax for your car. 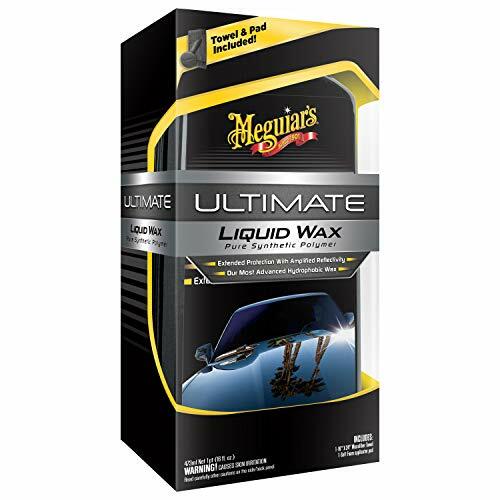 MEGUIAR’S ULTIMATE LIQUID WAX – 16 OZ. 1. 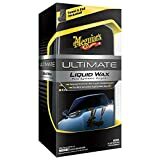 Meguiar’s Ultimate Liquid Wax – 16 oz. 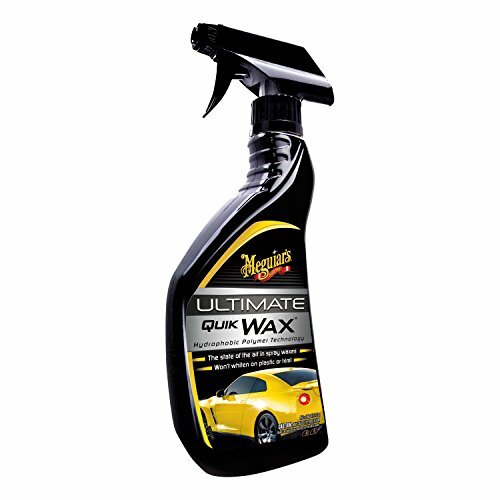 The Meguiar’s Ultimate Liquid Wax is recommended products which come with the rubbing pad and cloth as part of the package. The price is affordable and if you need a starting pack for car waxing this is a product for you. Its chemical formula delivers maximum synthetic protection, durability, depth of color, and reflectivity and special “ThinFilm“ technology provide for effortless application and wipe off even in full sun, and will not stain non-painted trim pieces white. 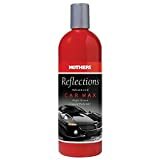 This car wax is made with advanced synthetic polymers crosslink to form a long-lasting protective barrier amplifying reflection for incredible depth and mirror-like shine. Since it comes with applicator pad and microfiber towel it is very easy to use and you will get perfect results if you follow instructions. It is safe to use in direct sunlight and it will protect your car fully. This is not a car wax but car polish so be careful. The difference between the two is huge as we explained previously. However, if you need a car polish in case your paint is fading and you want to freshen it up, this Liquid Glass LG-100 is a good proposition. It will provide super durable gloss finish for your paint and it will never crack, peel, chip or turn yellow. You don’t even have to remove it just repolish if you need to. It is safe to use on all painted surfaces or glass. However, this is an older chemical formula and it is non-CARB compliant it is not legal for sale in some areas and countries. The price is affordable and you will get a nice sized package which will last a long time and there are no problems with the product as various users reported. 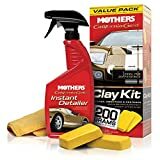 The Mother’s 10016 is an affordable and quality product with newer generation formula in clearcoat safe paint care and liquid polymer technology. It is safe for all kinds of paint and it is recommended for newer cars. Besides the wax layer, this product features a protective coat to paint making it not only shinier but more durable for a longer period of time. It is easy and safe to use and provide a high gloss finish to your paint job and look of the freshly washed car. It is also proven to be protective against sun and chemicals which can damage your car. You can get it as one bottle of a pack of six bottles if you have the need for that amount. 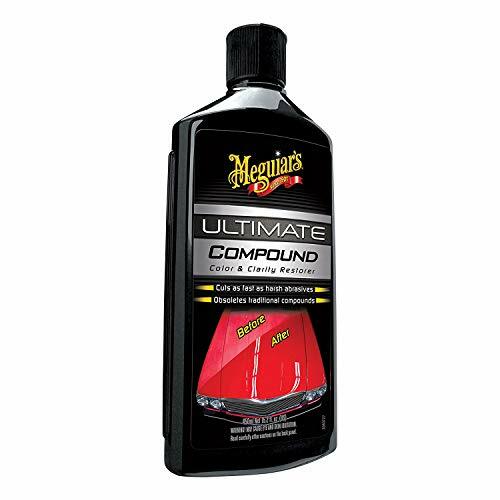 Meguiar’s is a well-known name in car care industry and their products are among the best. This one is interesting and very affordable car wax in spray form which is very easy and quick to use. You just spray this on your clean car and follow the regular waxing instructions and you should get a mirror finish in no time. Hydrophobic polymer technology provides relentless water beading protection that lasts for weeks. It will not leave a white wax residue on exterior plastic and trim pieces of your car. 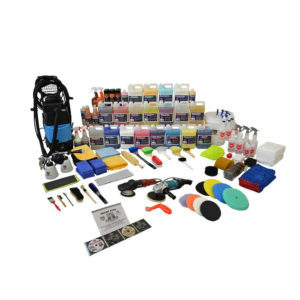 The spray bottle makes it very practical for using and it is also easy to transport. For the cheap price, you will get a decent amount of wax spray and it should last you a couple of months of intensive use. 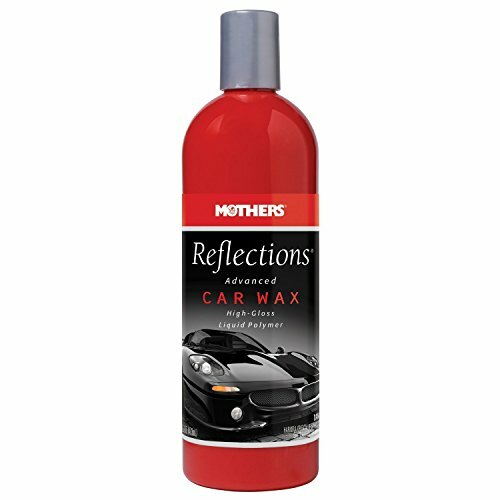 Another quality product is Mother’s 05750 which comes at an affordable price and it is made with carnauba wax. Carnauba is a natural compound which is perfect for waxing and gives a perfect finish and shine. However, this is not a 100% carnauba wax since it has added chemicals making it longer lasting and more durable. The interesting thing about this product is that you don’t have to remove one layer of wax to add a new one and you can wax your car over existing coat to give it more protection and shine. It is also heat resistant so it is good for use in warm areas. If you are planning to use it regularly it should keep your car shiny at all times and well protected from the elements. 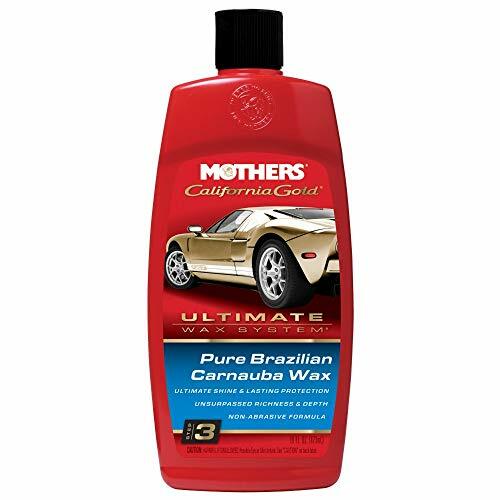 The 16 Oz pack is enough for numerous waxing and Mothers 05750 California Gold Pure in several packages and even in a big 1-gallon bottle for demanding users. GRIOT’S GARAGE 11171 CAR WAX – 16 OZ. TURTLE WAX T-415 PREMIUM GRADE RUBBING COMPOUND – 18 OZ. MEGUIAR’S G17216 CAR WAX – 15.2 OZ. 6. Griot’s Garage 11171 Car Wax – 16 oz. Griot’s Garage 11171 is very interesting product since manufacturer claims it is made from 100% carnauba wax content and it is water based. That makes it perfect since the carnauba wax is the best thing you can put on your car and it gives perfect shine and since it is water based it is also environmentally friendly. However, we have our doubts that are really 100% carnauba but it doesn’t matter. This product is silicone free and provides superior paint depth and clarity. The heavy carnauba content means a little goes a long way, and as long as it’s put on this, it’s easy to take off. The manufacturer claims it will give at least three months of protection after just one waxing. The price is affordable and it also comes in a big 1-gallon bottle which is good to know. 7. 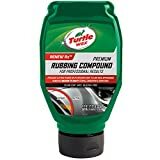 Turtle Wax T-415 Premium Grade Rubbing Compound – 18 oz. The first thing about Turtle Wax T-415 is that this is not a car wax and it shouldn’t be used as such. This is rubbing compound and it is for removing scratches, heavy swirl marks, surface blemishes and 1500 grit sanding scratches. If you have small scratches on the paint and imperfections of any kind you use this rubbing compound to clean it off before applying wax or car polish. Silicone free formula is safe for use in professional detail, paint and body shops and can be applied by hand or with an orbital or rotary polisher. This product is for use only as preparation for waxing or polishing. Be advised that is only for car paint and it doesn’t work on plastic or glass. The low price is very tempting but does not buy it if you planning to use it without waxing or polishing since it will not give you desired results. 8. 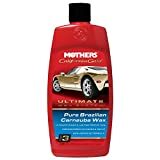 Meguiar’s G17216 Car Wax – 15.2 oz. A similar product is the Meguiar’s G17216 which is designed for removing oxidation, scratches, water spots, and blemishes without scratching. Cuts as fast as harsh abrasives restoring surface clarity without scratching or swirling. Chemical formula dramatically reduces the time and effort to restore abused or neglected paint finishes. 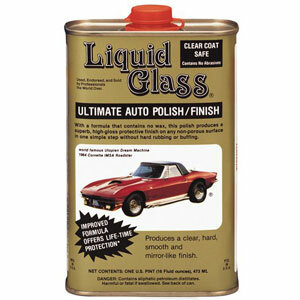 Its micro-abrasive technology leaves a “like new” finish and adds gloss to tired car paint. Despite the specifications of this product and its affordability, it isn’t proper car wax and it only can be used as part of the waxing process. In fact, using Meguiar’s G17216 will only serve as preparation for waxing. So have that in mind when you are shopping for car wax and car care products. 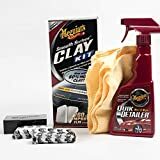 Very interesting and affordable product is Meguiar’s Clay kit which includes 2- 80-gram bars, clay lubricant, and a microfiber towel. The clay has cleaning purpose and-and it gives the same effect on the paint. The non-abrasive clay bar safely, easily and instantly removes paint overspray, fallout, environmental contaminants and more, making waxing easier and longer lasting. 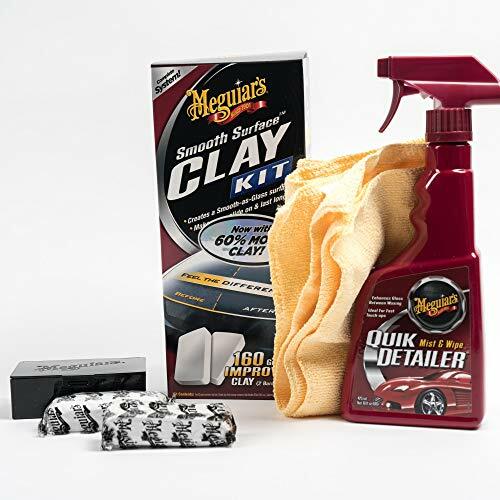 With Meguiar’s Smooth Surface Clay Kit, you will be able to make waxing easier and longer lasting and safely remove bonded contaminants. This is also a pre-waxing product which can not be used alone since it needs car wax to get the perfect results. It great as starting kit for waxing since it provides you with enough clay, lubricant, and microfiber cloth. 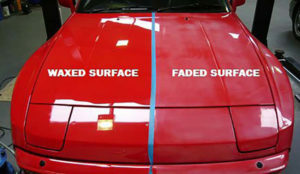 For best results use buffing machine which will equally put the clay on your car and bond it perfectly with the paint. A similar product is Mothers 07240 which comes at an affordable price and with a microfiber cloth and Showtime Instant Detailer included in the package. This product removes embedded grains of metal, tree sap, airborne environmental deposits and paint overspray for “new” look. It is the best way to really clean your car before a full waxing job. The clay bar isn’t hazardous to your paint and it’s just firm enough to pick up the bad stuff, without being too aggressive. However, this and similar products are for most demanding users who are looking for full protection and the long process of preparing and waxing the car. If you are looking for just a car wax and it is enough for you, you do not need this product. Before we start, we need to explain to you the difference between car wax and car polish because a lot of people have misconceptions about those products thinking they are the same. But they are not, in fact, car wax and car polish are two totally different kinds of products. The car wax is used primarily for protection and preserving of your paint job without affecting the paint and car polish is used for polishing the paint but it also uses an abrasive action to remove fine layers of the top coat protection to flatten out the surface to ensure an equal reflection of the light and thus a highly polished look and shine. Over the years, there has been a lot of improvements in car waxes as well as improvements in paint and lacquer technology. If you have an older car you will need an older type of wax and if you have a brand new vehicle you will need a brand new car wax formula in order to avoid any problems and be fully satisfied with the results. The modern acrylic automotive paint needs only newly developed types of car wax and if you don’t use that kind the results can be disappointing. Different car waxing products have different requirements in terms of steps and the time which are needed for the process. Car waxing is, in fact, a job which is time-consuming and you have to take that into consideration before you buy your products. That is why there are a few different kinds of fast and slow waxing to perfectly comply with your spare time. If you are choosing to do a full waxing job by yourself, you will need a proper set of tools. Set of cloaths (hard and soft surface) and a buffing machine. Buffing machine simulates work of your hands while waxing but in much more efficient and better way. You can adjust a number of revolutions, speed and you can change the top of the buffing machine in order to get the best results. For any car enthusiast which waxes his car, buffing machine is an essential part of the kit. If you are planning to do a full waxing job which includes washing, polishing, cleaning and waxing your car, it is best to do it all with a line of products from one manufacturer. This is because products from the same company work best together since they are made by the same people in the same laboratories and they are guaranteed to be compatible. 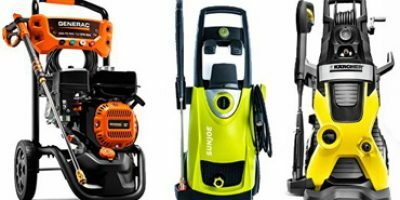 If you use products from different companies, sometimes there can be problems with compatibility and even some unwanted chemical reactions between the products. So it is better to be safe than sorry and it is best to buy the whole kit including buffing pad and microfiber cloth recommend by the manufacturer. You may also want to check out our selection of the most-popular windshield washer fluids. Car waxing is a little more complicated process than washing but just follow these simple instructions and you will master it in no time. 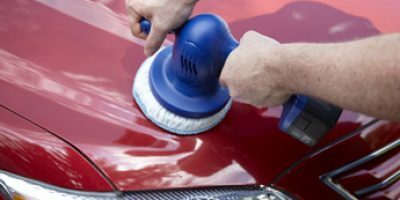 There is no point of applying car wax on the dirty car and in fact, it can damage your paint if the particles of dirt come between wax and the paint. That is why is very important that before car waxing car is fully washed and dried and to be sure that there is nothing on the surface of the car. It is important that the car is not in direct sunshine since it will cause the wax to dry faster and be harder to buffer. So always be sure that your car is in a nice shady spot and the perfect place is inside of the garage with good light so you can see everything. After applying you will have to wait for the wax to bond itself with the paint and read the manufacturers instructions on how long you have to wait before buffing. If you are using your hands, apply the wax directly on the cloth or spray it on the surface you want to cover. If you are using buffing machine apply the wax on the center of the pad and do not cover all of the pad surfaces since it will spill out during rotation. Do not put too much car wax! Too much of car wax will not do the trick and you should put a small amount regarding the manufacturer’s instructions. In most cases, a coin-sized amount of car wax is enough for 60×60 cm surface which is a half of the average hood of the car. If you use too little it will fail to deliver wanted shine and your work will not achieve anything. If you want the perfect results, we recommend you buy the buffing machine. 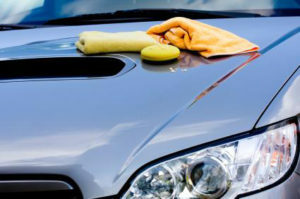 They are not expensive and they are essential if you want your car to look brand new. You can adjust the number of revs for slower and faster buffing but be advised that faster buffing just after applying the wax can cause damage. So start slow and then add speed for perfect results. Hand buffing is slower and more time consuming and you can never be as efficient and precise as with the buffing machine. Even if you are satisfied with the result the job is not over. After you rub of buffed wax on your car there is one more step in achieving a perfect finish and that is microfiber cloth or buffering machine cover. To have really a mirror finish, you have to go once over with slow polishing with a microfiber cloth. That will give you extra shine and will polish the wax just a little bit more. After you finished waxing your car, leave it for a couple of minutes to settle down and then test your work. Use half of glass of clean water and spill it on your hood to see the results. If the water perfectly slides and does not leave any mark, residue or bubbles, you are good but if the waters stay on the surface, you missed your mark. Do not wax very often! Waxing is a much more demanding process than washing and it shouldn’t be done very often. Do not wax your car each time you wash it since it can damage the paint after buffing. If you are a demanding user, you can wax your car every three months and recommend is 2-3 times a year. Best thing is to wax your car before the winter if you live in cold areas with salt on the roads since wax will keep your paint in good condition and protect it from the elements, snow, ice, and salt from the road. If your paint job has small scratches you can use paint sealant which covers that filling it with a transparent layer and makes scratches invisible. Most of the modern car waxes have this feature and don’t require any different process of applying. If you have a need for this product, just look for paint sealant and wax when you buy. You can wax a brand new car and you should do that if you wanted to keep it perfectly shiny and new looking for a long time. However, you must be careful and look for products that are made especially for that and comply with new car paint type. If you apply the wrong product you can cause yourself a lot of problems and even ruin your perfect new car finish. The car wax is an important part of the car care process and it isn’t just a thing you do to make your car look nice. It is also for the protection of your paint job which can be affected by dust, dirt, salt, sun, and debris. If you make a car waxing part of your routine maintenance, your car will look fresh and new for a long time and you can even stop rust issues. 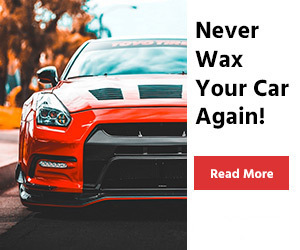 However, the waxing process is not so simple, you need to follow our guidelines and car wax reviews in order to get the best results and perfect finish and protection for your car. Read our product reviews and find the best car wax for you, avoid common mistakes and give your car the best protection and care possible.